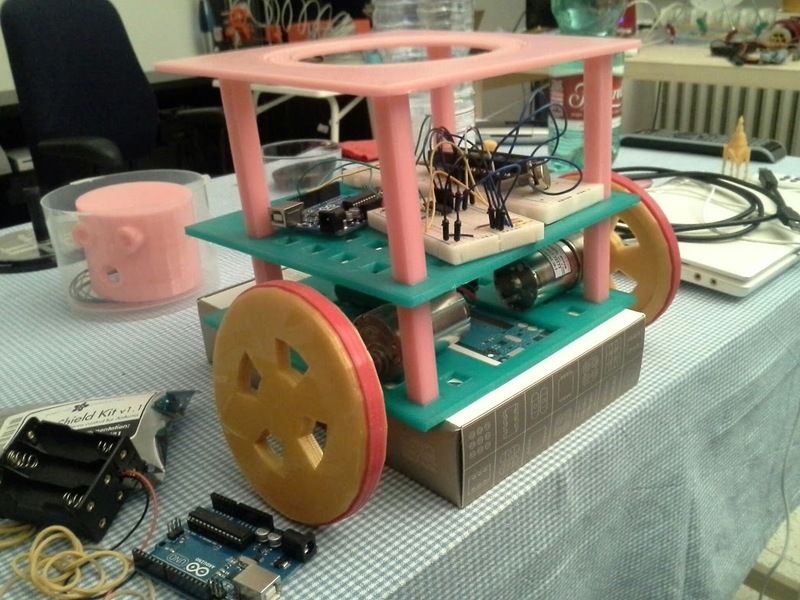 Bea Res, who will be participating in Sunday’s hangout on air, is building this Arduino-based robot. The head, at left, awaits attachment. We’ve gotten a great response to our call for robot teams for our newly formed Robot Hacks project. More than 52 teams have already registered and the G+ Community page is filling up with posts about designs and plans. The spectrum of ideas is incredible. Bea Res writes: “I am designing and printing an Arduino-based robot that is controlled by light and has a safety purpose for the house.” James Jarrard’s team is interested in desktop interaction: “Something that can move objects and be quite a useful and fun tool in collaboration work spaces.” Ross Bochnek’s team is interested in camera robots for motion control. Tune in Sunday Nov. 3 to see how our master makers will influence your ideas and help you shape your projects. The program kicks off at 1pm ET with a live event and Google hangout from Olin College in Needham, Mass., where we’ll converse with Intel Futurist and 21st Century Robot author Brian David Johnson, illustrator Sandy Winkelman, designer/fabricator Wayne Losey, and Olin College Professor of Mechanical Engineering and Design Dave Barrett. Joining us remotely will be robotics engineer and founder of Artisans Asylum Gui Cavalcanti, USC PhD research fellow Ross Mead, and more. Make sure to join our Robot Hacks Community to watch the program on G+, and contribute any questions, comments, ideas, or more, anytime you please. There are also limited tickets available for those who’d like to attend the event live.